Michael F. Bird. What Christians Ought to Believe: An Introduction to Christian Doctrine Through the Apostles’ Creed. Grand Rapids, MI: Zondervan Academic, 2016. 240 pp. $24.99. Dr. Michael Bird‘s latest offering, his most accessible book yet, is both enlightening for the average person in the pew and edifying for the student and scholar. Bird spends the first two chapters of What Christians Ought to Believe providing an introduction to creeds and an apologetic for why we need them. To a Christian world where the dominant creedal affirmation is “no creed but the Bible,” he argues that “by ignoring the creeds those who consider themselves to be orthodox are effectively sawing off the theological branches upon which they are sitting” (13). Bird shows how creeds are biblical, summarize the New Testament tradition, and marked out the boundaries of the faith. He provides an overview of the canonization process that demonstrates that the creed and canon were mutually creating and mutually reinforcing. Finally, he argues that creeds can both invigorate our faith and provide a sure anchor for biblical faith. The rest of the book (twelve chapters) is devoted to a systematic exposition of the theology of the Apostles’ Creed. Beginning with “I believe,” Bird explores the meaning of (Christian) faith itself and reveals it to be “our trusting response to what God has done for us and promised us in the gospel, which in turn pervades every aspect of our lives” (46). In illuminating the fatherhood and omnipotence of the Creator-God he addresses the controversial issues of the patriarchal language and the creation accounts and shows how the ultimate issue in both cases is the identity of God and our relationship to him. Bird introduces the doctrines of incarnation and hypostatic union as well as some of the Christological heresies; he helpfully spends a chapter on the life and ministry of Jesus (which is not mentioned in the Creed), showing how “Jesus’s messianic career is not simply the hors d’oeuvres to the atonement” (87) and probing the depths of what it meant to call Jesus “Lord.” He engages with critical views of the virgin birth but also highlights five dimensions of the its true significance (it was not so that Jesus would be without sin!). In regards to the atonement, Bird interestingly points out that while the early church formulated statements about the nature of Christ, it never attempted to reach a consensus on the precise mechanics or effect of the atonement. He provides a good overview of the main theories of atonement and rightly notes that while each is saying something true, some have a greater capacity than others to be the integrating theory. In a move that will surely ruffle some conservative feathers, Bird notes that he favors Christus victor as that integrating theory. Unlike many modern versions of the Apostles’ Creed, Bird uses “He descended to the dead” rather than “He descended to hell.” He helpfully explains the Descensus ad Inferos (explicating what the Bible says about Hades/Sheol and what Christ did there on Holy Saturday) and points out the main facets of the significance of the resurrection. The next chapter on the ascension is particularly helpful, as the ascension is probably the most neglected facet of Jesus’s career; it’s not just “Jesus’s return trip to heaven” (162). In expounding upon the person and work of the Holy Spirit, Bird warns us of the twin dangers of neglecting the Holy Spirit and overemphasizing his manifestations. He passionately argues for the importance of ecclesiology, of the church being part of the content of theology rather than just its packaging (193), and finally, reminds us that heaven is not the end of the world. What Christians Ought to Believe is one of the best examples of scholarship serving the Church. In this book, one of the finest biblical scholars of our day has written an accessible, popular-level introduction to the basics of the Christian faith. Biblical, theological, and historical concepts are simplified but not simplistic, and at every turn informed by responsible and robust scholarship. This is a great book for intellectually oriented new believers, Christians just starting to get serious about doctrine, as well as mature believers and beginning formal theology students. I can also see this being a great book to study together with someone you are discipling or in small groups. Most of all, this book needs to be devoured by any and all who are either anti-creed or have never studied the Apostles’ Creed. Last fall when I was just starting my formal biblical/theological education Zondervan sent me a copy of their new The Greek-English New Testament: UBS Fifth Revised Edition and New International Version, and it quickly became the Bible I carried around with me every day (as an aside, TEDS seems to be an NA campus, so my red UBS did draw a fair bit of attention amidst seas of blue at the library and in the classrooms!). The first reason why I was excited about this diglot stems simply from the fact that I didn’t own a UBS, and the only NIV I possessed was in the form of the new NIV Zondervan Study Bible, an excellent resource but too massive of a tome (I believe slightly bigger and heavier than even the ESV study Bible) to lug around every day. 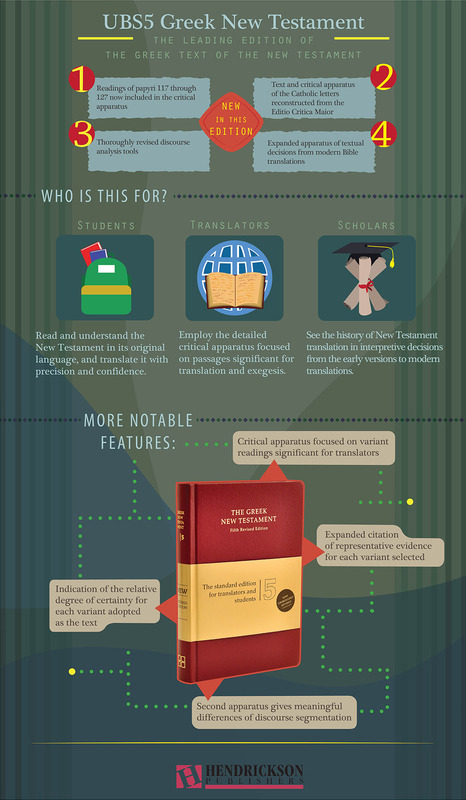 So I was rather excited to have the UBS5 and NIV 2011 together in one sleek, pretty package (see pictures below for a size comparison and infographic of UBS5 features) since I made heavy use of both the Greek and English NT virtually daily for classes. In addition to translation and exegetical work, I try to read a slightly larger portion of the GNT every day; I like to read the portion in English after reading the Greek since I’m still a newbie, so having them in parallel is very convenient. Some discourage new language students from using diglots because of how easy it is to “cheat” and short circuit the process, but it’s easy to not do that (just cover the English side and don’t look at it), and there are far easier/worse ways to cheat nowadays with Bible software). Beyond the differing critical apparatus, one unique feature of the UBS that I was not aware of until it was mentioned by my exegesis professor is the appendices of OT quotes and allusions. There’s an index of quotes in OT order, an index of quotes in NT order, and an index of allusions and verbal parallels. One downside of the effort to making the English parallel the Greek is that often the English page will have just a few sentences and/or cut off mid-sentence (see picture below for an example).While this sometimes looks and feels slightly awkward, I think this is an inevitable feature of a diglot and a small price to pay for the conveniences of the format. Overall, I love the new Zondervan Greek-English New Testament: UBS Fifth Revised Edition and New International Version. It’s my go-to New Testament for class, research, and devotional reading. Thanks to Zondervan and Academic PS for the review copy! Constantine R. Campbell. Advances in the Study of Greek: New Insights for Reading the New Testament. Grand Rapids, MI: Zondervan, 256 pp. $34.99. Just yesterday during a conversation with two friends at the seminary library, one of them mentioned two people I highly respect making a theological point based on the erroneous conception of the Greek aorist being automatically punctiliar. One is a doctoral student and another a professor, and neither is in the field of New Testament; but I was still surprised. My first thought was that they need to read Advances in the Study of Greek. Birthed out of a course in advanced Greek that Constantine Campbell taught at Moore Theological College before he came up over, Advances in the Study of Greek provides introductions the major topics at the cutting edge of NT Greek scholarship such as verbal aspect, deponency, discourse analysis, and pronunciation. Koine Greek might be a dead language, but scholarship surrounding it has been full of life in the past few decades. Outside of specialists most are unaware of these recent significant advances, and prior to this book there wasn’t an accessible way to learn about them. Advances in the Study of Greek is essential reading for anyone who deals with the Greek New Testament, from academically oriented laypeople and pastors to seminary students and professors, because the issues addressed here have a direct bearing on how we interpret the NT. Below is a a short interview with Zondervan and an extended interview with Shaun Tabatt. Thanks to Zondervan Academic for the review copy! Joshua W. Jipp. Christ is King: Paul’s Royal Ideology. Minneapolis, MN: Fortress Press, 2015. 208 pp. $44.00. Building off of and extending Matthew Novenson’s argument in Christ among the Messiahs: Christ Language in Paul and Messiah Language in Ancient Judaism that Paul’s use of Χριστός conformed to ancient Greco-Roman honorifics, Joshua Jipp’s Christ is King: Paul’s Royal Ideology argues that “Paul used, reworked, and applied ancient conceptions of the good king – both Greco-Roman and Jewish – to Christ in order to structure reality or the symbolic universe of his congregations” (9). Jipp begins in chapter 1 with a survey of ancient kingship discourse (Greek, Hellenistic, Roman, and Jewish), essential to understanding Paul’s kingship discourse, to provide the necessary backdrop for his study. Then a chapter each is devoted to the law, the Christ-hymns of Colossians and Philippians, participatory soteriology, and justice language in Romans, showing how kingship discourse as a source for Paul’s christological language provides the most helpful framework for understanding these passages. In the conclusion Jipp suggests that further studies examine Paul’s use of priestly metaphors and depiction of the church as temple in in light of the understanding of the king as priest and temple builder. He also relates his study to the topics of early Christology and participation. Over at the Euangelion blog Joel Wilitts has been interacting with this book and Dr. Jipp has been responding. Here is the first post and response. Daniel J. Treier and Kevin J. Vanhoozer. Theology and the Mirror of Scripture: A Mere Evangelical Account. Downers Grove, IL: IVP Academic, 2015. 280 pp. $26.00. Theology and the Mirror of Scripture is the inaugural volume of a new IVP series entitled Studies in Christian Doctrine and Scripture. Edited by Vanhoozer and Treier, this series in evangelical systematic theology seeks “fresh understanding of Christian doctrine through creatively faithful engagement with Scripture in dialogue with catholic tradition(s).” The first volume was penned by Vanhoozer and Treier “with the hope and prayer of commending anew the evangel, and evangelical theology, to evangelicals. At their best, evangelicals have sought to hold Christ first. The present book proposes how we might do that again” (p. 10). In contrast to the centered and bounded sets of the of the reformist and traditionalist camps, respectively, Vanhoozer and Treier propose in Theology and the Mirror of Scripture an anchored set “encompassing a Protestant ecumenical range of motion while anchored to the biblical, Trinitarian and crucicentric gospel” (21). This third way depends upon two fundamental metaphors: household (reflecting the ecclesiology of the book’s subtitle) and mirror (reflecting the aspiration of the book’s title). Vanhoozer and Treier begin in the introduction with a look at the main rooms in the evangelical household, examining their contemporary fragmentation and theological history. Then, Part One presents mere evangelical theology as an anchored set, addressing theological ontology and epistemology. Next, Part Two expounds upon the practical outworking of the agenda set out in Part One, relating prolegomena to ecclesiology. A concluding chapter expresses what the authors hope this manifesto for mere evangelical theology will accomplish in the church. Here, the authors bring out a final symbol for mere evangelical theology – the Lord’s Supper. Thomas H. McCall. An Invitation to Analytic Christian Theology. Downers Grove, IL: IVP Academic, 2015. 192 pp. $22.00. This book provides a brief and accessible introduction to the nature of analytic theology for the nonspecialist. Although “analytic theology” as a label is used in a variety of ways, a common, overarching description of the discipline is that it uses the constructive tools of analytic philosophy in the work of constructive Christian theology. In chapter 1 McCall provides a helpful overview of what analytic theology is, looking at both what makes it analytic and what makes it theology. He also addresses what analytic theology isn’t by responding to some common misunderstandings and objections, such as reliance on natural theology and substance metaphysics and lack of spiritual edification. Next, McCall looks at the relationship between analytic theology and the Bible as Christian Scripture, using the case for compatibilism as a case study for how analytic theologians can bring logical coherence to a biblical theologian’s narrative coherence. Then he provides an overview of the relationship between analytic theology and historical theology and provides two case studies related to Christology to show how analytic theology informed by historical theology can help defend classical orthodoxy and correct new constructive proposals. In chapter 4 McCall addresses the need for the boundaries of analytic theology to be expanded in order to serve the church and impact the world. And finally, McCall concludes with a reminder of the proper telos of analytic theology: as theology, the proper end of analytic theology is the glorifying of God. At sundry times and in divers manners in the past few months I’ve alluded to my long-time preference for the ESV (including here on my blog) in relation to the new NIV Zondervan Study Bible. When I received a copy of this study Bible in July it was the first time I had picked up an NIV in about 8 years (of a total of “only” 10 as a Christian!). I’ve chosen not to write a review noting all the various features because 1) a lot of reviews are doing that and you can find one with a simple Google search and 2) the NIVZSB has a stunning website where you can explore it in detail. Futhermore, I wrote a bit about it on the Logos Academic blog a few weeks ago, highlighting its most unique feature (focus on biblical theology). Therefore, I would instead like to discuss the controversial issue surrounding the NIV 2011. Last week our President Dr. David Dockery hosted a Q&A with Dr. D. A. Carson on the new NIV Zondervan Study Bible, and I decided to pose the question to Dr. Carson when the floor was open for questions. Specifically, I asked him how he would respond to complementarians who won’t give this new study Bible a chance because of the fact that it uses the NIV. Both in person and online I’ve seen fellow complementarians decry this new study Bible for its use of the gender neutral NIV, and there was a time when I would have done the same. Carson noted the need to distinguish between changes in language that are culture-wide and don’t necessarily bring with it huge theological/cultural biases, and those changes driven by ideology (e.g. those on the far left who want to address God as “Our Father and Mother.” While there are feminine analogies for God in Scripture, He is never addressed as mother or described with feminine pronouns). In other words, complementarians need not worry over gender neutral pronouns as long as the pronouns for God are right. And this is because language is ever-changing and shaped by use. Whereas decades ago masculine pronouns were understood to be generic, they are now largely used/understood to refer to males. Carson drove home the point by saying that because today “men” connotes men only, it’s actually a better, more faithful translation in certain contexts (e.g. Acts 17:22) to say “men and women” as opposed to “men.” In other words, because of how English has changed, it’s better to use gender inclusive language when the original languages clearly refer to all people, male and female. Carson also mentioned that he and Doug Moo had stepped off the board of CBMW when they connected complementarianism to linguistic commitments, and that the council has since dropped that connection. I was not aware of either of these facts and found them both particularly enlightening. The NIV 50th anniversary website has a very helpful piece chronicling the history of revisions of the translation, noting especially the research and data concerning the use of generic pronouns and identifiers in contemporary English. The issue is also noted in this brief video where a few members of the translation committee such as Doug Moo, Karen Jobe, and Mark Strauss discuss translation and linguistics. Carson himself wrote a very helpful book on this matter (The Inclusive-Language Debate: A Plea for Realism) nearly two decades ago, and it’s a great place to go for more in-depth treatment of this topic. All that to say, I hope the fact that it uses the NIV does not deter complementarians from making use of this unique new study Bible. From the mature high school student all the way to the adult Bible study leader, all will find the NIV Zondervan Study Bible helpful for grasping the unfolding narrative of Scripture. 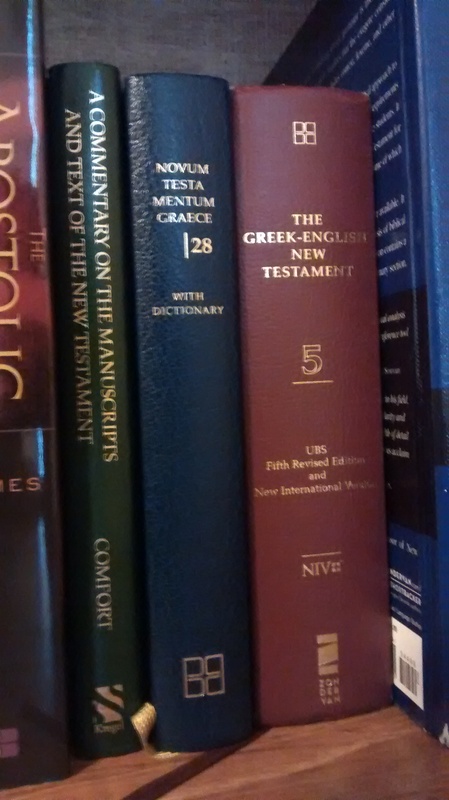 Whereas many lay Christians see the Bible as a random collection of unconnected stories and moral prescriptions, this study Bible has a huge potential of making the average person in the pew a better reader and interpreter of Scripture, able to see the interconnectedness and development of the biblical storyline and able to trace the glorious themes that run from Genesis to Revelation. Check out the NIV Zondervan Study Bible website to explore the features! Thanks to Zondervan for the review copy! Charles Halton ed. Genesis: History, Fiction, or Neither? 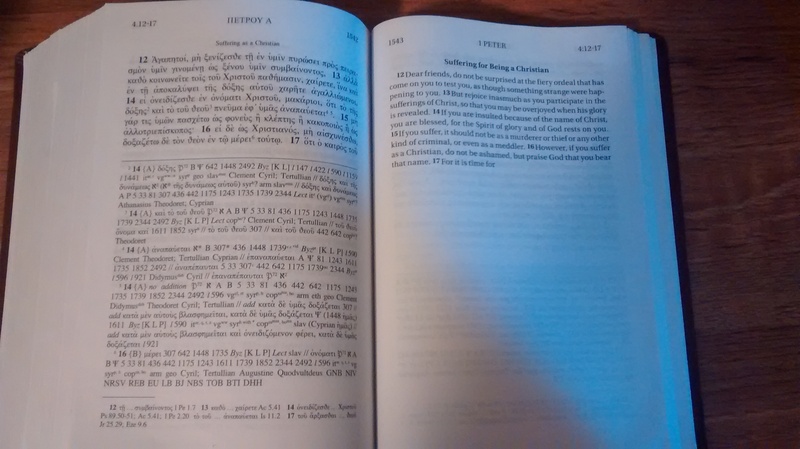 Three Views on the Bible’s Earliest Chapters. Grand Rapids, MI: Zondervan, 2015. 176 pp. $16.99. In contemporary evangelicalism there’s hardly a biblical/theological topic more divisive than that of origins. The various topics under this umbrella (such as creation versus evolution, an historical Adam, etc.) are all impacted by how we interpret the early chapters of Genesis. Hence, though recent years have seen a large number of books published in the area of origins (including one on the historical Adam from the same series as the volume currently under review), Genesis: History, Fiction, or Neither? 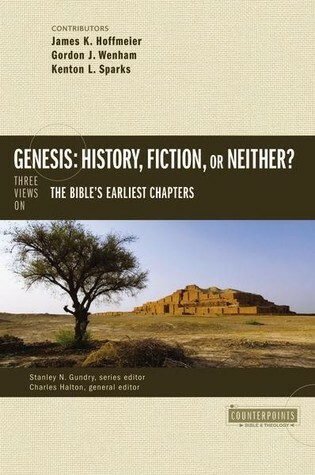 offers a unique and complementary perspective by addressing the topic from the perspective of the genre of Genesis 1-11. As editor Charles Halton notes in the introduction, “Readers will first need to understand the genre of the text and how it worked within the author’s cultural environment before they will be able to successfully address the question: ‘What does this text mean? '” (18). Each of the contributors address four issues in their essays: the genre of Genesis 1-11, why this is the genre of Genesis 1-11, the implication of this genre designation, and the application of their approach to the interpretation of the story of the Nephilim (6:1-4), Noah and the ark (6:9-9:26), and the Tower of Babel (11:1-9). Following the common structure of Zondervan’s Counterpoints series, each essay is followed by a response by each of the other contributors. This year marks the 50th anniversary of the (commissioning of the) NIV, the most widely read modern English translation of the Bible in the world. Celebrations began at ETS last year with a dinner hosted by Zondervan and will culminate this fall with the release of the NIV Zondervan Study Bible. I am pretty excited about this study Bible. I haven’t read the NIV in years and wasn’t expecting to want to read it exclusively ever again, but when this study Bible lands on my doorstep I plan to read it cover-to-cover right away. A bit of background is warranted, I think, for those reading this who might be where I was just a few years ago. My history with the Bible is that from spiritual inception ten years ago to about a year in, all I read was the NIV. It was the Bible I was given when I became a Christian, and it was the only Bible that the people I knew used, taught/preached from, talked about, etc. But then I discovered the NASB. I loved the idea of a faithful, word-for-word translation; and so, I abandoned the NIV and exclusively read the NASB. Fast forward another year, and I had become a rabid cage-stage young, restless, Reformed Calvinist. So of course, I became ESV-only. With the advent of the 2011 NIV, my already low opinion of the NIV (due to a lack of understanding about Bible translation) sunk to its nadir due to the new NIV’s gender neutering. I say all this in case someone reading this holds the misguided notions I once did. It’s a great time to give the NIV another chance with the forthcoming NIV Zondervan Study Bible. This study Bible is edited by D.A. Carson and it was the full-time project of Andy Naselli for four years. If my words mean nothing, surely theirs have a lot of clout! Check out the video below to hear some of the members (e.g. Doug Moo, Karen Jobes, Bill Mounce, etc.) of the translation committee talk about the ongoing work they do to ensure a faithful and beautiful translation. The video after that is of Dr. Doug Moo’s talk at the NIV celebration dinner at ETS last year entitled “We Still Don’t Get It: Evangelicals and Bible Translation Fifty Years After James Barr” (PDF here for those who prefer reading). The last video is of Dr. D.A. Carson talking about some of the features of the NIV Zondervan Study Bible. And finally, though the year is just over half over, the special 50th anniversary free NIV Bible App is still worth checking out for limited time access to some NIV study Bibles and other resources. Stay tuned for more of my thoughts on the NIV in general as well as the new study Bible.